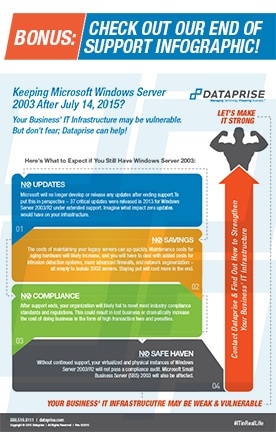 Without security updates and paid support, businesses continuing to use Windows Server 2003 will have an unprotected infrastructure and be extremely vulnerable to hackers and viruses. If your business protects confidential information, such as medical or financial records, without the updates you could fail to meet many industry-wide compliance standards and regulations. While you may think you’re saving money by not upgrading, you’re actually taking the more expensive route. Costs of maintaining legacy servers can add up quickly, as maintenance costs for aging hardware will likely increase. Furthermore, because you’re no longer receiving security updates, you’ll need to invest in intrusion detection systems and more advanced firewalls to ensure your servers are secure. Determining the migration solution best suited for your business requires an in-depth inventory of your current infrastructure and an exploration of your future IT plans. This is a golden opportunity to take the pulse of your current and future IT needs, and plan accordingly. Don’t know where best to begin? The experts at Dataprise can help you migrate quickly and efficiently, with your business needs in mind. Contact us today for more information.